I couldn't resist seeing "Julie & Julia" last night, and I was delighted by Meryl Streep's exuberant portrayal of Julia Child. Streep captures Julia Child in all her joyful enthusiasm for food and for life, and her characterization never descends into caricature even though Child was almost a caricature in herself. Stanley Tucci is perfect as Paul Child, and he conveys a genuine love for Julia in every scene. The contrast between these two characters is striking, and it makes a pretty damning statement about American womanhood in 2009, especially compared to the same in the immediate postwar era. Have we really become so fragile, so immature? 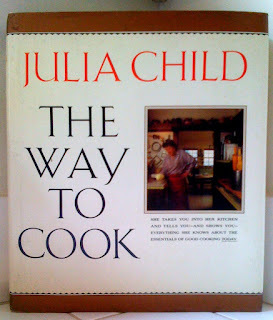 Instead of getting bogged down in gloom, however, I decided to dig out my copy of Julia Child's The Way To Cook and make something nice and summery. Stuffed tomatoes, anyone?